Fun! We are planning a trip to the Dolomites in May so I look forward to seeing your photos from there. Oh, what fun! I think live blogging is the way of the future! Did you use the device to take the photo or just to help you upload it? I guess you are not going skiing in May, but you should be prepared for some snow at higher altitudes nonetheless. It doesn't really matter what does your plan include. Since nature in those parts is simply breathtaking I am sure you will have an excellent time there. 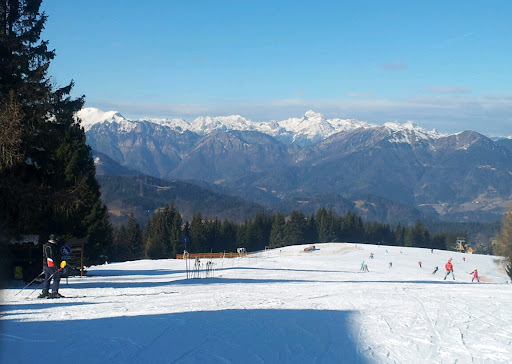 I've been skiing in Dolomites before and you can check out some nice photos from the area if you click on the label "Skiing" in the right column of my blog. I think you might just be right about that - live is the future! I do have yet to find a nice mobile application with just the right set of options. I am not really satisfied with the one provided by Google (it is simply called Blogger). Suggestions anyone? I did use only my phone to publish this post though - including taking and cropping the photo. Do you like it? Yes, definitely - the photo is really good quality for a camera phone! Nice capture! This place is worth to be visited. Thanks. It is not a very large ski resort, but it is still sufficient for a day. And gorgeous views of snow covered Alps also add to the overall feeling. I love live blogging. We can read and look at the pictures instantly. I had been trying to do that for some time now but still don't know what will I talk about. Great picture, it make me want to go there and join you skiing.